Definition: Inflammation of inner ear as a complication of middle ear suppuration. Localized erosion of the bony labyrinth by cholesteatoma producing a fistula between middle and inner ears. Accumulation of serous fluid in membranous labyrinth, still no pus. - Healing by fibrosis (dead ear). - Intra cranial extension of infection. Vertigo: mild, transient, induced by sudden movement, tragal pressure, , no nausea or vomiting. - A test to detect labyrinthine fistula. - Brief vertigo ± nystagmus. - On: siegle, tragal pressure, manipulation of aural polyp. - Positive test :vertigo ± nystagmus. - False negative: (Very small, Non-functioning ear, Inadequate sealing, Cholesteatoma mass prevents pressure transmission). Vertigo: Severe, continuous, spontaneous with nausea and vomiting. Nystagmus: Spontaneous ,directed to diseased ear. Reversible sensory neural hearing loss. 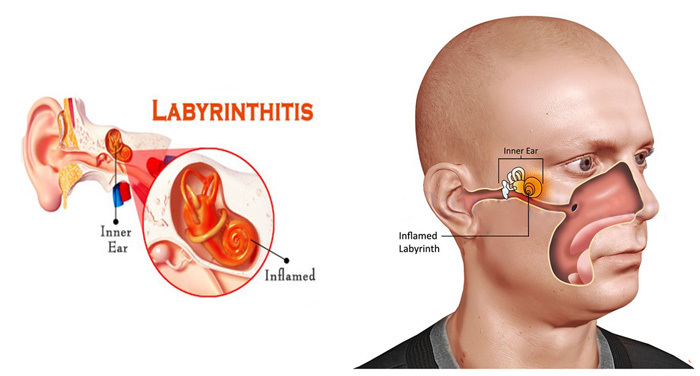 Similar to serous labyrinthitis but more severe. No or minimal general manifestation, as the amount of pus is too small. Distinction between 2 and 3 is retrospective. 3- Systemic massive antibiotics specially that crosses BBB: sulpha, chloramphenicol and cephalosporins. 4- Treat middle ear infection. - In fistula: Mastoidectomy, remove the cholesteatoma and cover fistula with graft. - In suppurative labyrinthitis with SNHL and vertigo: Surgical labyrinthectomy used to be done but nowadays it is obsolete due to powerful antibiotics, and need to preserve the skeleton of the cochlea for cochlear implant if indicated later. - After vertigo settle, and undercover of parenteral antibiotics, radical mastoidectomy is done to control the source of infection. Tamer Mobarak, E.N.T resident at Qasr-Elainy teaching hospital, Cairo university. Please note that we will be notified by e-mail about your comment , So be careful . Any medical questions will be answered .